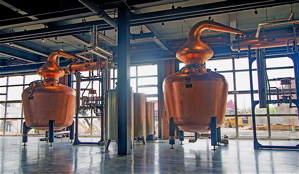 Two words come to mind when checking out Copper & Kings, the new brandy distillery that opened production in the Butchertown neighborhood of Louisville this year, vintage and craft. 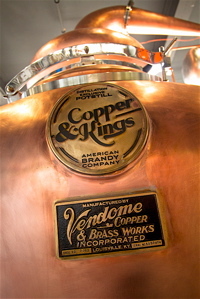 The distillery has been making small-batch brandy for months rather quietly, but in July Copper & Kings opened its doors to the public. The scene-stealer here is the enormous copper pot-stills, which were manufactured in Louisville by the distillery’s Butchertown neighbors, Vendome Copper and Brassworks. These handcrafted and hand-hammered pot-stills were designed specifically for the distillation of brandy, and maximize the copper contact with the beverage to ensure the aromatics of the brandy flavors remain uncorrupted. The idea to build this craft distillery, and locate it in Louisville in the heart of bourbon country, is that of Joe Heron and his wife Lesley’s, who hail from South Africa. They have spent millions turning an old warehouse in Butchertown into a modern distillery with the belief that bourbon drinkers will make room in their liquor selections for brandy. This is the American dream distilled to life. They have taken a love for brandy and an ambitious idea – and from nothing have created a neighborhood attraction where their dream has come to life. The distillery also has a basement maturation cellar, art gallery event space, office suite and third floor tasting room with sky deck. The final phase of construction should be completed by late summer and will outfit the outdoor courtyard with a fire pit, pig roast, catering prep kitchen and lush landscaping. Their brandies are batch distilled exclusively in copper pot-stills, and are non-chill filtered with no added sugar, boise (powdered oak, shavings or infusion) other flavors, synthetic chemicals or caramel colorants for an uncorrupted, authentic, natural flavor, nose and color. They’ve adopted a ‘low & slow’ distillation philosophy – relatively low distillation temperature for a longer, slower distillation, maximum copper contact, and a distillation batch ceiling of 135 degrees to express concentrated flavors, aromas, and smoothness. The Heron’s are not new to the beverage industry. After creating a nutrient-enhanced soda called Nutrisoda they sold it to PepsiAmericas, and their hard cider, Crispin Cider, was sold to MillerCoors. “I think what we try to do for Butchertown is to do something that reflects a culture of sophistication and style with a little bit of edge and a little bit of rock and roll,” says Heron. The word “brandy” is from the Dutch word “brandewijn” – burnt wine. And they’ve been buying up the best unfiltered wines they can find. The unsulfated wine is distilled at about 135 degrees, until it boils, and then the vapor (which has all the alcohol) is captured and distilled a second time, aged in barrels for two years and then is ready for bottling. 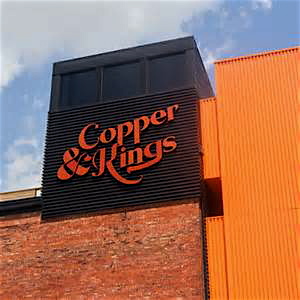 Copper & Kings is aiming for a middle void in the brandy market between Christian Brothers, at $15 and cognac (like Courvoisier) at $50-$75. They hope to see Christian Brothers’ drinkers trade up to something more special but still affordable, along with some cognac drinkers trading down to something more affordable but of similar quality. The Heron’s also intend on luring bourbon drinkers into experimenting with their brandy to add a new flavor to their palates – which is why they chose Kentucky as the home for Copper & Kings. This entry was posted in Liquor, News and tagged Brandy, Copper and Kings. Bookmark the permalink.